This was my first book by Vivien Chen and it won’t be the last. I really enjoyed Lana and the folks at Asia Village where her family’s noodle shop is. When Lana’s friend and owner of the souvenir shop next door is found dead along with her husband, she, along with the other workers in Asian Village, are shocked. With her parent’s out of the country and Lana in charge of Ho-Lee Noodle Shop, it’s busy, but Lana and her BFF roomie find time to try and find out what happened and why. Even if her (maybe) boyfriend is the lead detective and asks her not to get involved. This is a great read and I can’t wait to read the first book in the series and to see what the future holds for Lana, Adam, Megan and the Ho-Lee crew! 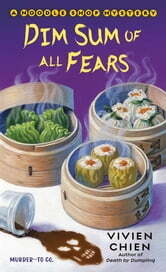 Dim Sum of All Fears by Vivien Chien is the second book in A Noodle Shop Mystery series. Lana Lee is surprised when her parents announce they are departing for Taiwan and leaving Lana in charge of the Ho-Lee Noodle House. Just when Lana has a second interview for a well-paying office manager position. The day her parents depart for Taiwan, Lana arrives at work ready to focus on the restaurant and show her parents she can do the job in their absence. Then Isabelle and Brandon Yeoh who own Charm City Souvenirs are found dead in their shop. Isabelle and Lana shared a common love of books and had become friends. It turns out that Isabelle and Brandon had several skeletons in their closet that are now coming to light. Despite being told repeatedly by Detective Adam Trudeau to stay out of the investigation, Lana cannot help but do a little digging. Which one of the suspects could have done the deed? Join Lana on her quest for the truth in Dim Sum of All Fears. Dim Sum of All Fears is nicely written and has steady pacing. If you have not read Death by Dumpling, you will not be lost. 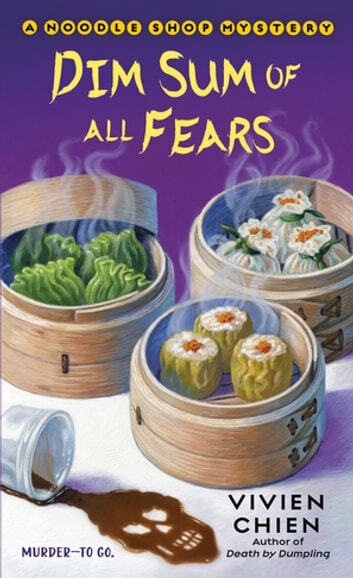 The author provides the backstory readers need to proceed with Dim Sum of All Fears. There are a variety of quirky characters that include the Mahjong Matrons, Kimmy Tran and Esther Chin. In the beginning of the book, Lana shocks everyone by showing up with her hair dyed blue. I was baffled as to why she would do this when she was interviewing for an important office manager position. At twenty-seven years old I believe it is time for Lana to quit antagonizing her mother and figure out what she wants to do with her life. Lana had days to find someone to cover for her, so she could attend the interview, but waits until it is too late (evidently, she really did not want the job). The bickering between Lana and her sister especially at the restaurant in front of customers and employees (unprofessional and inappropriate) was tiresome. I was baffled by the scheduling at the restaurant. I thought it was unusual that they open in the morning (I have never seen this type of establishment open before 11 a.m.) and during the lunch hour rush there would be only one waitress on duty (the other employee would be on her hour lunch break). The mystery was straightforward, and I could identify the killer before I was a third of the way through the book. There were a couple of suspects and Lana was proactive in asking questions. Detective Adam Trudeau tells Lana to repeatedly stay of the investigation and, of course, she has no intention of listening to him. There is a cliché love triangle between Lana, Adam and Ian Sung. Personally, I preferred Death by Dumpling to Dim Sum of All Fears (it was not as silly). My rating for Dim Sum of All Fears is 3 out of 5 stars (it was okay). I hope the author ups her game in the next A Noodle Shop Mystery.